The H10 Roma Città is tucked away from Viale Marconi in a commercial street just 5 minutes from the Trastevere. With its narrow streets, charming restaurants, and throbbing nightlife, many consider it one of the city’s most welcoming neighborhoods. 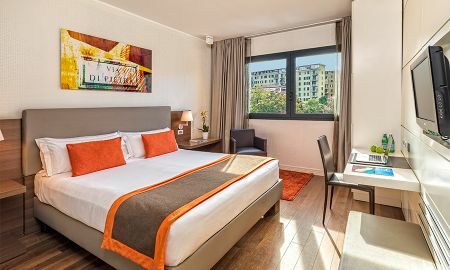 This newly design hotel boasts 178 rooms and 3 suites with the myriad of necessary facilities guests will need to ensure a memorable stay in the Italian capital. 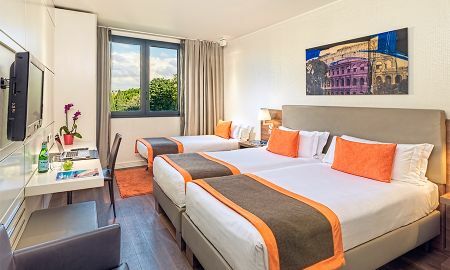 The hotel’s relaxation area sits on the top floor, complete with gymnasium, outdoor pool, outdoor jacuzzi, and solarium (seasonal outdoor services) with views of the glittering Tiber River snaking through the landscape in the distance. The Restaurant Uno Zero Uno offers a tempting melange of culinary specialties and the Lobby Bar serves cool, refreshing cocktails, keeping guests tastes satisfied throughout the day and night. The hotel’s Seven Meeting Rooms come equipped all the necessary amenities for business related events, with natural light creating a relaxing, yet productive ambience. On Viale Marconi, a very commercial street, just 5 minutes from the Trastevere, one of Rome’s most charming neighborhoods, famous for its winding narrow streets, restaurants and night life. Please note, starting from the 1st of September the hotel will charge 6,00 EUR for city tax per person/ per night from 1 to10 consecutive nights. Children under the age of 10 are exempt.